In the tables below you'll find current tuition charges and fees* by degree or program type. 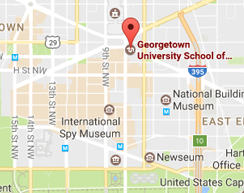 The cost per credit for degree programs reflects courses taken within the School of Continuing Studies and does not reflect the cost per credit at other schools within Georgetown University. Fees include a one-time transcript fee for all students. A Georgetown University Health Insurance charge is assessed for students taking 8+ credit hours at the graduate level or 9+ hours at the undergraduate level. If you have your own outside insurance plan, you may qualify for a waiver of the Georgetown Health Insurance plan. In addition to tuition and fees, the Office of Student Financial Services has determined the average Cost-of-Attendance Budget for full-time Liberal Studies and Professional Studies students. The average Cost-of-Attendance reflects estimated costs, including living expenses (rent, food, personal expenses), books, and travel for full-time students. *Please note: Tuition is subject to change and may vary by course of study. SCS strictly adheres to the deadlines and policies of the University described under Tuition, Fees, and Refunds for undergraduate and graduate students. Students should refer to the SCS Academic Calendar for appropriate refund deadlines. All refund requests are handled through the Office of Billing and Payment Services. Georgetown University reserves the right to cancel any courses without prior notification; however, every effort will be made to provide information on cancellations in a timely manner. In the event of cancellation, Georgetown University will refund tuition charges accordingly. To obtain the Form I-20, students must show they have sufficient financial support to cover their academic costs of attendance at Georgetown and minimum living expenses for the Washington, D.C. area. All estimated expenses provided by the OGS are for immigration purposes only: to issue your Form I-20 and help prepare your financial documentation needed to obtain the F-1 visa. F-1 Students: The U.S. government requires that you show proof of funding for the first academic year of study (9 months) to receive your Form I-20. If your program is less than 9 months, you must show proof of funding for the duration of the program. F-2 Dependents: If you will bring a spouse or child with you to the United States, you need to show additional funding: $2,942 for the first dependent and then $1,520 for each additional dependent, which includes living expenses and health insurance. What documents can I show for Proof of Funding? All documents must be in English. You can submit a single source of funding or a combination of financial documents to the International Student Portal. You may submit no more than four (4) bank documents demonstrating personal/family funds. Submit either your official bank account summary or bank letter. Official bank account summaries may be obtained through your online bank account portal or received in print from the bank. Bank letters must be signed and printed on the bank's official letterhead. You will need to submit two documents: your family member's official bank information and a Family Support Form (PDF). Official bank account summaries may be obtained through an online bank account portal or received in print from the bank. Bank letters must be signed and printed on the bank's official letterhead. Download and complete the Family Support Form (PDF). Sponsors must complete all form fields and provide a physical ink signature. A Family Support Form must be submitted for each individual family member named on the bank documents. For example, if your mother sponsors you with one bank statement and your uncle sponsors you with one bank statement, you will need a Family Support Form from your mother and a Family Support Form from your uncle. If you are applying for more than one semester, please contact us.